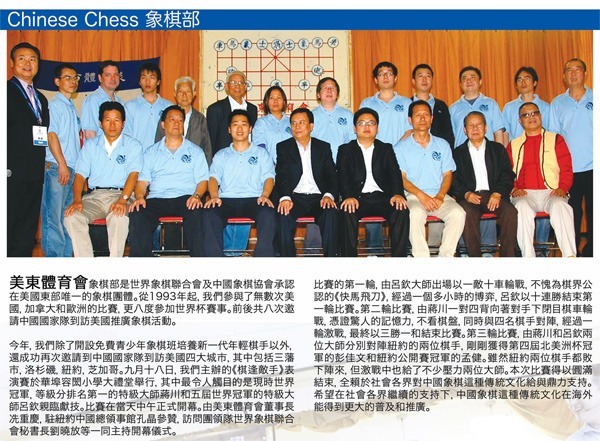 In 1993, Patrick Chan was personally brought in by John Ngai, ex-president of UEAA, to form the chess team. In the same year, we sent a team to Vancouver, Canada to participate in the Europe-North America Championship where we finished third. In 1994, we invited the National Team of China to New York to promote the game. Grandmaster Liu Dai Hua from China played 11 players from New York simultaneously and BLIND-FOLDED. This stunning performance was witnessed by 600 audiences. We were then recognized by the World Xiangqi Federation (WXF) and China Xiangqi Federation(CXA) as the lone representative in the USA-East region. From 1995 thereafter, we have sent teams to different parts of the world to participate in the World Championship every two years. It will be the tenth time we are in this event this coming October. In 2007 and 2011, we had female players participating. In 2009, we had a Caucasian player breaking the barrier and in representing UEAA. Over the last 20 years, we have invited the National Team of China to the United States eight times. Patrick Chan, the present VP of WXF, was the first one who initiated and helped to bring about the North American Championship in 2005. This big event has been upstaged ever since. UEAA chess team was also a participant in the prestigious 2008 Beijing Olympic Mind Game. We were also in several international big events such as the Yang Guan Lin Invitational and the Han Xin Invitational tournaments. For something close to home, we also have our N.Y. –N.J. friendly matches every year. In summary, there is a lot of activities and anyone who is interested is welcomed to join. We want you to be part of us.